The popular path to owning a house in Nigeria is like the path to everything else – building it yourself. Unless they have millions saved somewhere, most people tend to build slowly and in a timeframe that suits their budget. Building a house is not an easy task, as it requires immense financial discipline and a need to be as fiscally conservative as possible. In this article, I will discuss the whole building process with an aim to enlighten you on how to give your building project a plan and a direction. This should help you in planning the start and completion of your building project in 2018. It is important to understand the basic steps involved in building a house as starting the process with a plan will always lead to better results, regardless of whether you’re building your first or second house. Building on another person’s piece of land is tantamount to making a generous charitable donation to them. Therefore, if that is not your intention, the first step to achieving your property ownership dream is purchasing a piece of land you are going to build your house on. When considering what plot to buy, you will need to consider factors such as the location and surroundings – will you have easy access to schools, markets/shopping centres, church, work? Are there any new facilities coming up in the the area? What type of soil will your house stand on? More importantly, what’s the price of the land and do you need to pay in one chunk, or can you pay in instalments? Ensure that you get all documents proving of ownership of the land. I always advice my clients to get one plot of land (18mx36m i.e 60ft x120ft) however you can settle for half plot if your budget does not meet the price of a full plot in the area of your choice. Once you have purchased your piece of land, don’t start a foundation, don’t leave it idle, don’t look for an architect, don’t look for anything, just start building your fence and gate to avoid trespassers on your property. Once the purchase of the land has been settled, all the necessary documentation has been secured and the property is secure, your next step is to enlist the services of an architect to draw the plan of the house you plan to build. After discussing your requirement and designs with the architect, it is the architect’s job to represent your ideas on paper and ensure that your plans meet the building standards of the authorities in line with the location of the plot. There are regulations regarding what can be built, where and how, and the architect is the best person to help you through this process. Before a standard house is erected, involving an architect will be the most sensible thing to do. Money-saving cheat: There’s an Australian website that sells complete house designs for around $10 (N3,500)per plan , saving you probably around 95% off the cost of getting a plan drawn up by your architect. If you want to purchase or modify these to your own taste, here’s a link to buy a complete house design plan. Have a look first and see if the plans are to your taste before you make a commitment. Once the architect has completed your drawings, you will need the services of a quantity surveyor to come up with the Bill of Quantities (BOQ). A BOQ is basically an estimate showing the estimated cost of your project. This is a document that could come in handy if you do have to seek bank financing to fund the construction of your house. Now your land has been purchased and secured, you have your building design drafted by the architect, the BOQ has been drafted and a plan is approved by the local authorities, you can now enlist the services of a builder or contractor. A builder is someone who ensures that what you have on your plan is what is constructed on ground and as close to the estimated cost as possible. A contractor is simply a business contractor who brings everything together to advance your building – he/she supplies the machines, labour and materials for the construction. As the owner of the build, it is up to you whether you choose to source and supply the materials yourself or leave it all to the contractor. Even though most contractors are also engineers, your contractor may hire an engineer of he/she has no engineering background himself/herself. In Nigeria, there are two very common approaches to building a house in Nigeria. In the Do-it-yourself (DIY) method, the client (owner) has funds in place, purchases a house plan from an architect, purchases all the materials and enlists the services of a contractor to provide labour and materials, such that it is the contractors role to direct the construction activity to completion. In the Design-and-Build method, the client/owner approaches a developer/construction company like us. The Developer or Company has a team in place that will consist of professionals – contractors, sub-contractors, architects and quantity surveyors-each with defined roles to take on the entire project from design to handing over the keys. 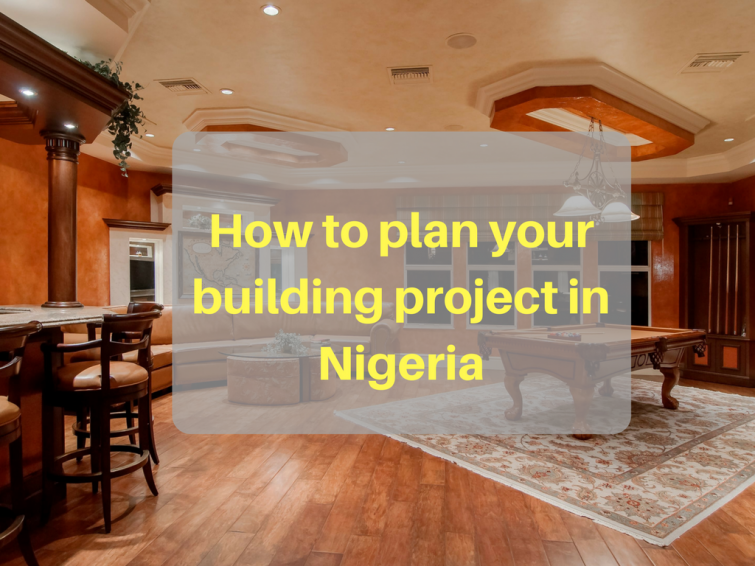 While there’s no right or wrong method to use when building your own house in Nigeria, both of these approaches have their own advantages and disadvantages. Thank you for this wonderful post, I have a plot in ikorodu, how do I go about the fencing? Happy new year to you, if you need us to handle the fencing for you, please send me a mail at samuelajoseengineers@gmail.com but very soon I will be writing on ” The process and Materials required for fencing your plot in Nigeria. Hi, I love the write-up. Please, is it possible to get a land in Benin City in monthly installment payment? If yes, can you help with one? I know of estates that do such in Lagos , but I don’t know of any that does such in Benin city but I will advise you know the size of plot you want and cost of such then save towards it. I want to begin a fencing project to my 1 and a half plot of land purchased recently at my village in Orlu Imo State. Ive had 4000 6inches block moulded already. With provision of water also in place. My builder sent me a ridiculous quotation he tagged ‘FENCE WORK with center beam’amounting to 1,209,000.00 after i had moulded block that cost me about 800,000 on its own. Pls advice me on what to do. I simply wished to thank you so much again. I am not sure what I might have carried out in the absence of the actual secrets shown by you over my field. It previously was a very intimidating dilemma in my view, however , witnessing your expert form you processed the issue made me to leap over gladness. Now i am happy for this support and as well , believe you really know what an amazing job you have been accomplishing training some other people using your blog post. More than likely you’ve never met any of us.